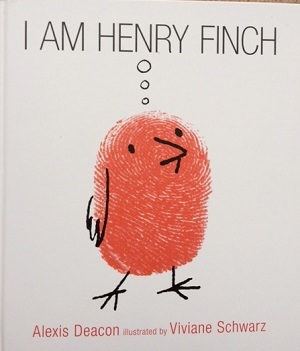 “I am Henry Finch, he thought. The realisation that he can have his own separate thoughts gives him the freedom to have his own identity, and ambitions, and to take his own separate course of action. His aspirations to greatness lead to adventure and enable him to overcome adversity (depicted here by the beast) and finally to enlighten his fellow finches on the gift of free thought and freedom. By the end each one of the finches has its own separate ambition, from travelling the world to falling in love. Not only is the story liberating, but the genius is pairing it with Viviane Schwarz’s illustrations. She uses red fingerprints (apparently gathering them from her friends) to depict the finches, and has added wings and faces with simple black strokes. The cartoon-like faces lighten the tone, and the fingerprints give the book a dynamic distinct identity of its own. ← Is My Child Old Enough?